On Friday, May 11th, I woke up at 6:30am. I started my day with a trip to the ATM, the local farmers market, and then a fresh and delicious Room2Board breakfast burrito. 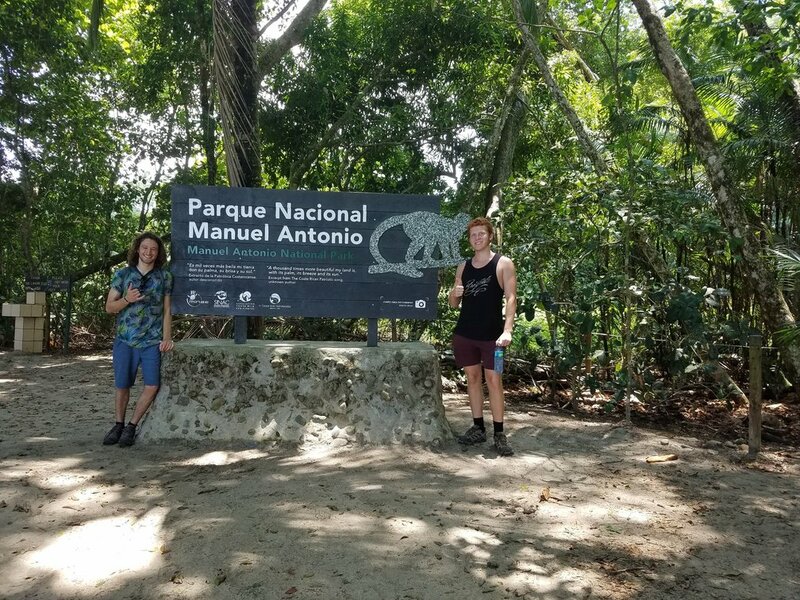 After that, a fellow volunteer, Jacob, and I were prepared to set out on a one day journey to Manuel Antonio National Park. We left the hostel at 8:20am to catch the 8:30am bus to Quepos from the bus station directly behind the hostel. The bus came late by about 10 minutes but there were locals waiting for it when we arrived. The bus to Quepos cost 1.325mil in one direction, took an hour and 15 minutes, and the final stop was the bus terminal in Quepos. The bus driver stopped and let everyone out on the street right in front of it. 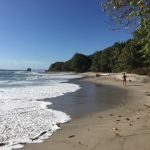 We went to the teller at the ticket counter to ask about the bus to Manuel Antonio. 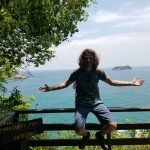 It is a white bus with blue splashes on it; it leaves every 15 minutes, takes about 15 minutes, says Manuel Antonio on it, and costs 325 colones each way. The bus dropped us off in the town of Manuel Antonio, at a blue bus station with some wonky looking benches. Everyone got off at that point, so we did too. There were two restaurants on either side of a thinner road leading up into the park and a sign pointing towards the park. I went into a restaurant on the left side called Marlin’s, and got a sturdy espresso. We applied sunscreen there, which ended up being unnecessary because most of the trails in the park were enveloped in greenery and the tall trees blocked most of the sun. We began to walk up into the park; on either side of the road there were many Ticos selling souvenirs and food at “good” prices which only seemed to get higher the closer we got to the park. Right before the entrance to the park, on the left side, there is a blue building that says: “COOPEALIANZA” on it. That is the only place where tickets are sold, and they are $16 (9.136mil) if you are not from Costa Rica. At the gates of the park your bags are lightly searched: you are only allowed to bring soda, water, wrapped sandwiches, and cut fruit into the park. We went without a tour guide and explored the trails at our own pace. It was fortunate that we went without a guide because every once in a while we would see a group of people with a tour guide stopped and staring at something. That was a cue for us that there is something good to look at that we probably would not have noticed! That way we good to see exciting things while moving at our own pace. We saw a few small sloths hanging from trees, albeit not clearly, but that depends on the day. Sometimes you are lucky, sometimes you aren’t. We walked along the wooden pathway and took in the scenery, there were crabs and iguanas on the way to the beach area. For us the trip was divided into two sections: beach and trails. We cleared most of the trails in about two hours. While walking along the trail down to the beaches we encountered monkeys and racoons. The animals were co-existing with the people on the trails. There was a playful monkey who seemed to be putting on a show for peoples’ reactions. There was also a racoon who sneaked up to some people on the beach, probably because he smelled food! There were many beautiful viewpoints along the trails. Jacob brought a GoPro and we documented our walk along the Cathedral Point trail. 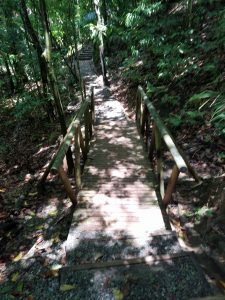 The trail was rated as moderate on the map but there was no climbing or any difficult terrain, just wooden walkways and the occasional stairs. After we finished the trail we spent some time on the beach! The water is so blue and the sand is soft, white, and not too hot! The people were unevenly distributed and some parts of the beach were crowded and others weren’t, but all were equally pleasant to relax on and swim in. Take your pick! There were also monkeys and racoons running up and down the beach so close that you could touch them! After we finished on the beach, we dried off on the picnic benches in between the two beaches, at which point a tour guide pointed out to us a sloth in the trees. 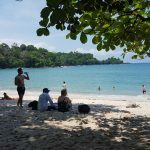 After a quick look, we retraced our steps back to the bus to Quepos, which stops on the other side of the street for the opposite direction. Upon arrival to Quepos at around 2:30pm, we were informed that the next bus to Jaco would leave at 3:30pm. We purchased tickets in advance, which is highly advisable if you would like to guarantee a seat, and doesn’t cost any extra. We then walked up the main street in front of the bus terminal in search of food. Right as it began to rain, we entered a restaurant called Soda Sanchez where we good some cheap, tasty Costa Rican food: casados! They were 2mil a piece and quite filling. After eating, we blasted through the rain a few city blocks back to the bus terminal and caught the bus to back to Jaco. I pulled the string to have the bus stop after passing the Club de Cielo condominiums which would be on the right side of the bus, which is a good point of reference if you are not familiar with the Jaco area and where the closest stop to Room2Board is. Overall we had a great day trip and enjoyed a great deal. The park is a relaxing walk and we didn’t take much with us: sunscreen (for the beach), a refillable water bottle (Costa Rican tap water is safe, and there were many clean bathrooms in the park), a towel, we wore swim trunks and hiking shoes, but took flip flops in the backpack. I would highly advise it as a day trip if only to the one park!